Thank you for sharing this idea. I was wondering, do you think there is some risk that the combined company after the merger will see a drop in share price, because a lot of people perhaps would want to sell immediately after the merger? Perhaps, but you could hedge that risk by shorting PFLC or HCHC (depending on which deal goes through) during the period in which the reference price of the PFLC/HCHC stock for the deal is determined. Thanks for the idea. One questions for me remins: Why is HC2 capable of paying 5.25 USD and still seeing value in the transaction. If I look at the book value, it’s at 4.76 USD. Is the BV understating the true value? 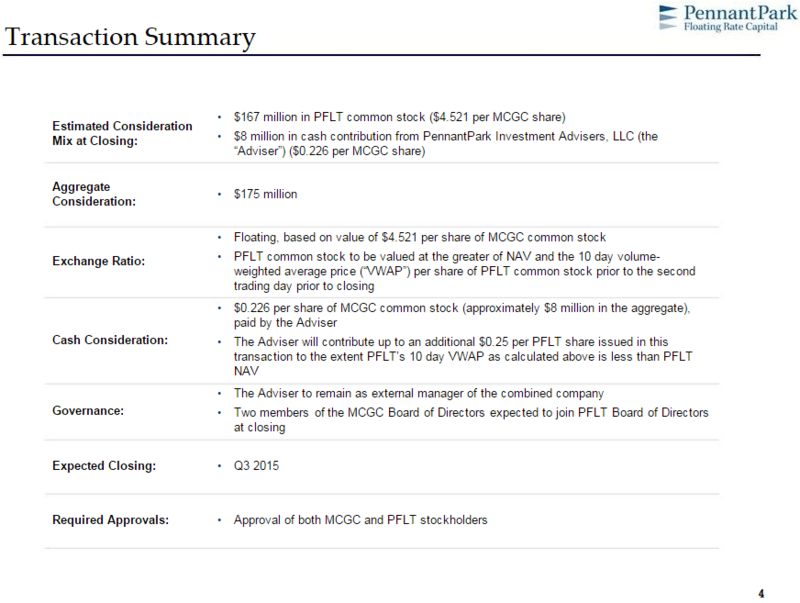 MCGC has a lot of NOL carryforwards (with zero book value). These are presumably valuable to HC2 although I’m not quite sure how much value they have since their use should be limited after a change of control event. Or Falcone thinks he’s paying with overpriced currency. If HCHC is overpriced by 20%, then he can still get decent value by paying $5.25. That could indeed be another possiblity. Looks like MCGC balks again. Still going with $4.75 from PFLT. HCHC improves offer, adds protections. MCGC shareholders need to organize. With shares falling to 4.62 USD the risk/reward is now even better. The soap continues: http://www.sec.gov/Archives/edgar/data/1006837/000156761915000831/s000944x2_ex99-1.htm . Yeah but it will probably get rejected anyway. The first offers were compelling too but MCGC is not acting in the best interest of its shareholders. (but obviously you knew that already). I’m wondering why Falcone is not launching a tender offer. Is he afraid he doesn’t have enough support yet? I think if he would launch a tender offer he would probably be not allowed to simultaneously pursue a deal with MCGC, so that would only be an option if everything else fails. What to do now after Falcone is out of the picture and the shares fell? I calculate a spread of 4.2%, close at 4.75 USD in 3 months latest. What are the main reasons not to buy now?